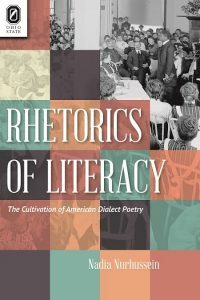 Rhetorics of Literacy: The Cultivation of American Dialect Poetry explores the production and reception of dialect poetry in late nineteenth- and early twentieth-century America and investigates the genre’s rhetorical interest in where sound meets print. Dialect poetry’s popularity stems not only from its use as an entertaining distraction from “serious” poetry, but as a surprisingly complicated pedagogical tool collaborating with elite literary culture. Indeed, the intersections of the oral and textual aspects of the dialect poem, visible in both its composition and its reception, resulted in confusing and contradictory interactions with the genre. In this innovative study, Nadia Nurhussein demonstrates how an art form that appears to be most closely linked to the vernacular is in fact preoccupied with investigating its distance from it. Although dialect poetry performance during this period has garnered more attention than the silent reading of it, the history of dialect poetry’s reception proves that readers invited the challenge of printed dialect into their lives in unexpected places, such as highbrow magazines and primary school textbooks. Attentiveness to the appearances of dialect poetry in print—in books, pamphlets, magazines, newspapers, and other media—alongside its recitation are necessary to an understanding of its cultural impact. Recontextualizing familiar and neglected poets, Rhetorics of Literacy proposes new literary genealogies and throws light upon the cultural and literary relevance of the laborious and strange reading practices associated with dialect poetry that made it distinct from other popular literary genres.